a 1,000 year old redwood that has survived fire, flood and logger’s axe. 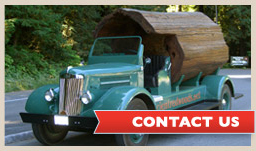 ANCIENT REDWOODS RV PARK is located one mile north of Redcrest, California, on the world famous AVENUE OF THE GIANTS. 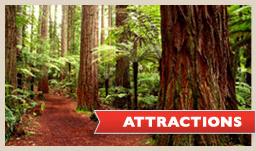 The park sits amongst the tallest and oldest living things in the world, near Founders grove, Rockefeller Forest and Humboldt Redwoods State Park Visitor Center. 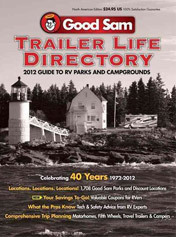 You can find us in the Trailer Life Directory... click here to see our listing on their web site. Also please post a review on RV Park Reviews. Thank you for your support! 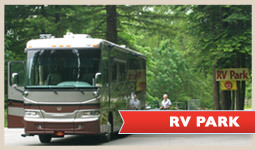 Click Here to view photos of our RV park and the surrounding area. Est 2008, the newest 49 space RV Park. Big Rig Friendly! Good Sam Club! Easy access for the largest RV’s to the smallest camp trailer. Each space has 20, 30 and 50 amp service. Easy water hook ups and sanitary dump stations are available at each space. All spaces are paved and flat with grass medians for picnics, BBQ’s or just out enjoying the sun! Large RV’s with sliders and pop outs welcome. Laundry and shower facilities available and this summer we plan on building an outdoor gathering area including seating and BBQ! REDWOOD GIFT SHOP AND PARK STORE is located near the park entrance. 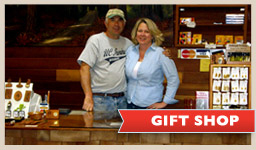 Our gift shop has been family owned and operated since 1967. We sell only the finest locally made redwoods items, including tables, clocks, carvings, bowls, redwood magnets and Christmas ornaments. Beer, wine, ice, picnic supplies, ice cream and snacks are available in our Park Store. 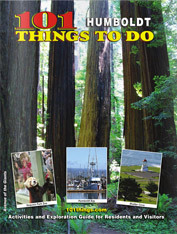 Surrounded by Humboldt Redwoods State Park, near Rockefeller Forest and Founders Grove on the World Famous Avenue of the Giants. Swimming and sunbathing at the Eel River is nearby. Be sure to check out our advertisement in Big Rigs Best Bets Campground Directory and the Good Sam Club publication. Registration is required upon arrival. Checkout time is 11am. Facilities and grounds for registered guests only. Refunds at management’s discretion. Registered guests may have visitors with management’s approval. Rates are based on double occupancy, children 5 years and younger are free. All additional guests are $5.00 per day. Guests 17 years and younger must be at registered site at 10pm. Please do not disturb your neighbors. Common park facilities and grounds are SMOKE FREE. Pets not allowed in restroom or common areas. Owner’s must clean up after their pets. Disposal bags available at various park locations. Campfires are allowed in grill and BBQs only. Do not leave any fire unattended! Restrooms will be open 24 hours. Please put disposable diapers and trash in outside waste cans. We have our own septic system, so please flush toilet paper only! Please use trash cans located in designated areas. Please use recycling recepticals for cans, bottles and plastics. Our park facility is within an environmentally sensitive habitat. Feeding of any wildlife is strictly prohibited! Protect our wildlife by staying inside the park boundary! Please obey the speed limit of 5 MPH at all times. One RV or sleeping unit and vehicle per space. RULES AND FEES SUBJECT TO CHANGE WITHOUT NOTICE. Below is a ariel video of the beautiful Rockefeller Forest!